She is said to first rode the bike at a young age of 12. She was popularly known as HOG (Harley Owners Group) Rani, Paliwal was on a motorcycle trip from Kashmir to Kanyakumari. Paliwal was making a documentary, 'Ye Hai India', on her cross-country journey, which ended horribly at an accident-prone spot. 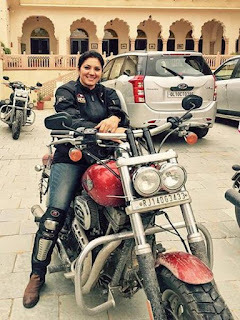 A panel of four doctors which conducted an autopsy on well-known woman biker Veenu Paliwal said she died due to a "blunt abdominal trauma rupturing liver", after her friend Dipesh Tanwar had alleged that wrong injection at a government facility caused her death. Paliwal's last message on her Facebook page read, "When the going gets tough, the tough get going." A legion of her shocked friends and admirers said that was her credo in life. Her family members are yet to come to terms with her death. Bollywood actor John Abraham tweeted, 'My heart goes out to Veenu Paliwal. May her soul RIP. From a fellow biker. Respect." During an interview, she once noted that her inspiration was her father since childhood, who himself was an "avid biker". Although she was passionate about bikes but it was only after getting into college when she learned to ride motorcycles from her college friends. However, she herself did not own any motorcycle then. Paliwal was married but soon after the marriage, her husband restricted Paliwal from riding bikes but to follow her passion Paliwal divorced her husband and lived with her two children.